Fish regulate the water that surrounds them using the process of osmoregulation. This process is what allows fluid from the outside to be absorbed in, which brings essential minerals (ions) to compensate the ion loss that happens through urination and diffusion of the gills. This keeps the fish in a homeostasis state, which allows the fish to live and function. Saltwater fish have this same process, but it involves drinking the water, instead of absorbing it. If this process is disrupted or isn’t able to happen by a lack of minerals being absorbed, this is a major stressor for the fish, which weakens the fish (all stress weakening immunity… being chased, temperature, poor diet, etc.) and once immunity is lowered, the fish is not able to resist disease. This is why long term experience and research has pointed to osmotic stress being the number one reason for disease and osmotic stress has been able to be traced to oxidation (acid build-up) in the aquarium. This oxidative stress (along with other stressors) leads to poor osmotic function, which leads to weakened immunities then leads to disease. This research and experiment below shows how oxidation leads to disease. Please know this has been also tested on 1000s of aquariums long term to see true effect on fish as this type of stress harms long term health. It isn’t noticeable in day to day function in fish. Just like someone might not be able to measure the amount of stress a person is under everyday. This may be considered pseudoscience, but really much of everything we know is applied pseudoscience and the major advancements we do know wouldn’t be known without it first being pseudoscience. Unfortunately for aquatics, very little research is done in this field as it doesn’t pay bills and cost more than some may think its worth. All work around this topic has been sponsored by Carl Strohmeyer from American Aquarium to help improve the aquatic industry and hobby. Applying this science has helps hundreds of thousands of people in the hobby, corporations such as Disney World, and universities. So, this research has reached millions of people. If there’s still doubt about this research, than try to prove something else as the cause of disease in our fish. Not using red herring, logical fallacies, or personal attacks, which working and having conversions with thousands of people, yet not one has been able to do this. Simply, even say 30 years of keeping a 100 of tanks, still doesn’t come close to the experience of 1000s of tanks with the amount of observation and research that has been put into this topic of disease prevention. This is a major cause to the onset of all disease including human disease. This information holds the key to defeating major disease, such as cancer. Oxidation is the loss of an electron by a molecule atom or ion. Reduction is the gain of an electron by a molecule atom or ion. This is known as Redox Balance, a balance measure of oxidization and reduction. The simplest way to measure is pH- potential of hydrogen (acids vs alkalinity). rH- relative hydrogen is the new science to measure immunity potential of a given source. Oxidation Potential or Redox Balance Potential can also be measured by the amount of ions (energy) using a ORP (Oxidation Reduction Potential) meter. Acid is not harmful in its self, but can be compounded with multiple oxidizers & stress causing a break down of the immunity. Example, a fish can prefer more acidic water, but with the loss of ions and the combination of other stressors the immunity is weakened. Acid removes positive charges of ions necessary for osmotic function, unless they are replenished. In an open system, such as a river, stream, or ocean, these positive charges are constantly replenished, like an alternator on a car battery by water constantly running over rocks. This is why acidic water like the Amazon River with pH swings does not have this oxidative stress on fish. This is not the same as a close system such as an aquarium as there’s not this constant charge (unless an attempt to make one). Constant charges can be attempted from many water changes, constant water drips, dosing mineral ions, or letting minerals constantly dissolve in the water from a block source. ORP can be measured in the water column or substrate (such as for plant health). ORP can be augured that it effects fish, plant, and coral growth as it’s an electrical measurement and these are electrical creatures. These can remove electrical ion charges of a mineral. The minerals will still be present in the aquarium, but will have no electrical charge. These minerals are seen in General Hardness readings of freshwater aquariums or Calcium and Magnesium readings of saltwater tanks. Again, you can have a higher GH, Calcium, or Magnesium reading, but that doesn’t mean the electrical charge is present. This lack of charge would be seen on an ORP meter. The goal to health is to combat the oxidative stress with the addition of reducer or enabling negative electrical charges (such as what a sterilizer does). The belief that regular water changes will help keep a reduced replenished aquarium. There is also the belief that water changes can be stressful to fish, so they are limited. The water change removes waste and also replenishes the electrical charge of the aquarium. Simulating the acid (oxidizer) build up in the aquarium over time. The idea behind a Redox balance isn’t that we want a completely reduced environment or a high oxidized environment, which is very typical in an aquarium. Oxidization is necessary to break down waste to have a Nitrogen Cycle, but all too often aquariums will have high amounts of oxidization long term. What is needed is oxidization with a focus on steady long term reduction. The test above shows the same water being treated differently for reduction. On the right, a 50% water change was preformed. On the left a calcium and magnesium block was used. The results shown are an hour after. The mineral reduced the pink Potassium Permanganate. The 50% water change remove about 50% of the pink hue from the Potassium Permanganate meaning there was some reduction done, but the oxidizer still present. Fresh minerals are more more effective at reduction. Conclusion– Minerals and water changes should both be used for good aquarium maintenance. 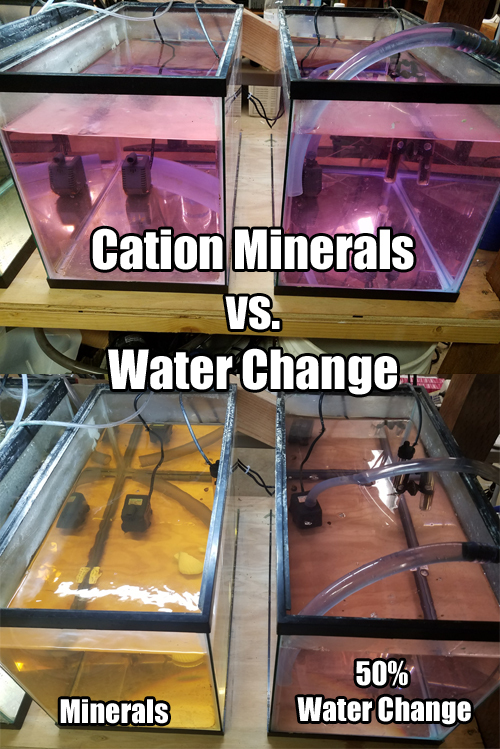 While minerals are effective at reduction, the hard mineral amount will continue to increase and a water change is needed to remove the mineral. Fresh minerals will have the electrical charge, but then become depleted leaving the uncharged mineral behind in the water. If more minerals are added, it should be timed right after a water change. Water changes by themselves are not enough to control constant oxidizers. Constant water changes would have to be preformed to be as effective as minerals as it would constantly replenish the minerals like manually dosing minerals. Mineral blocks are suggested to let dissolve making a constant electrical release and then not having to regularly dose. UVc Radiation has been shown to have anti-oxidative properties, in the way it removes a negative charges ability to effect a positive charge. This results in reduction. Above shows the effect of UVc on tap water using an ORP meter. Generally, water is oxidized from chemical treatment and the UVc had 5-50 point reduction. The UVc has a strong effect when a stronger amount of oxidization is present. This can be seen on the last few readings after the water change on the graph. To give some idea of ORP and their positive oxidization value or negative reduction value. Above shows effects of UVc on water when a strong oxidizer is present. Potassium Permanganate is used as a strong oxidizer. Aquarium on the right has the sterilizer running at level 1 sterilization. The aquarium on the left is neutral. Nothing, but water flow. The effect after 24 hours was the sterilizer clearing all the additional oxidization. Conclusion- UVc is impactful to oxidization and should be used along with minerals and water changes. Level 1 or 2 is best for the most effect, so learning the amount of UVc and flow to run the sterilizer is important. Sterilizer has most effect when more oxidizers are present. 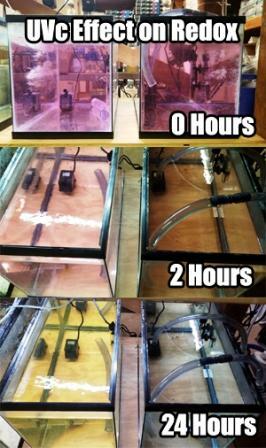 Sterilizer should be used constantly as oxidization builds constantly in the aquarium. The point of this article and study is to show that Reduction is an important part in keeping fishes immunities boosted as Oxidization is constantly wearing on a fishes immunity. Reduction will constantly combat this ware. Each method above should be employed to insure optimum health of fish. This is not an easy subject for me to understand even with this long article. I am going to have to read and re-read it a few times and even then I am not sure I will understand it all. So how does Calcium and Magnesium become electrical charged in nature in the first place? And could there be a way to do the same in an aquarium. Cal and Mag will have a charge and maintain the charge from water running over the mineral. This keeps a constant change as long as the water is running. In aquariums we wont have this. In some ponds, there can be river ways that will mimic this. For aquariums, we just have to keep dosing minerals or do water changes to have replenishing electrical charges. A mineral block that dissolves is best. Many aquariums have some kind of water moment through filters could that help if the filters also had some rocks with Calcium and Magnesium in them? Might be a good experiment to try. it would have to be good flow right over the rock. To help the rock break down and release the minerals. Like maybe the rock waterfalls you see on some ponds if they had rocks with Calcium and Magnesium in them? A fun and educational way to learn about aquarium keeping and the water world around us. Based on real professional experience and advice. Lots of videos and just having a good time. How to clean a sponge filter. EP 2- Evil Dr. Ich Takes the World! EP 1- Evil Dr. Ich Takes the World!